Highly detailed small artwork of the Mustang Badge Emblem of the running horse on the Red, White and Blue stripes. The script ‘Mustang’ in bold blue font is below the badge emblem. Starting from the bottom of the artwork, we have this magnificent ’82 spec red beauty displaying the front end detail of this era from the ‘egg crate’ grille, dual headlight assembly and the sports front bumper spoiler with the additional driving lights. The accuracy of the factory alloy sports wheels, and the high head rests as seen in the interior, is totally eighties here folks! This was the first year of the Fox-platform based Mustang GT. When the '82 models rolled into the showrooms, Ford, the press, and the public summarized the new Mustang in a phrase: "The Boss is back!” Not coincidentally, the HO engine debuted along with the reintroduction of the GT nameplate. Available in 3-door hatchback only, the GT featured the first true "HO" 302 as standard equipment. The major upgrades and design changes which distinguished the new 157 horsepower HO 5.0L engine from its 302 predecessor, and provided 17 additional horsepower were a 2V Motorcraft carb (369 CFM) fed by a dual snorkel, high lid air cleaner, an aluminium intake manifold, a more aggressive camshaft with a double row roller timing chain, larger and deeper nylon valve stem oil seals and 8.4:1 CR sandcast pistons. While it was rumoured that the camshaft used in this engine was a marine cam, in reality the marine cam was ultimately rejected for actual production due to low torque numbers. The camshaft actually used was a design used previously in a 351 Windsor two-barrel passenger car V-8 (more specifically the 1973 Torino). Other features of the 5.0L GT included cast iron exhaust manifolds dumping into a single muffler with dual outlet exhaust (“Y” pipe with transverse catalyst), SROD 4-speed overdrive transmission, a 3.08:1 Traction-Lok rear axle (7.5 inches) with factory traction bars and a beefier TRX handling and suspension. Following closely behind is the smokin’ black “hopped-up” ’87 GT Mustang warmin’ up those fat rear tyres...just somewhat. The artwork here is brilliant depicting the customisers’ ride with that heavily modified hood induction, chrome aftermarket wheels and wide tyres. The tyre smoke is brilliant, as is the overall detail of this model. The 1987 Mustang GT charged into the new model year with both extensive restyling (inside and out) and with more wild ponies under the hood. With the competition hot on their heels, the Ford camp turned up the heat with the introduction of the ‘87 5.0L HO. The 5.0L EFI was upgraded a massive 25 horsepower with a hotter 302 featuring a bigger intake plenum and a larger 580 cfm throttle bore (increased from 58mm to 60mm along with a revised inlet duct). Needing to correct its poor decision to change the heads for the 1986 model year, Ford realized the casting molds were gone for the pre-'86 heads. Fortunately, Ford found a solution within its truck division. The 302 trucks used a cylinder head similar in design and performance to the old wedge-type heads and, being a direct fit, the E7TE truck heads were matched to the H0 5.0L Mustangs beginning with the '87 model year. These heads featured better breathing valves, opened-up exhaust ports, and 9.0:1 CR dished-top forged pistons replacing the previous year’s flat tops. 19 lb-hr. injectors, a tuned length aluminium manifold (with better flowing runners), roller lifter cam and EEC-IV electronics system all carried over from ‘86. Stainless steel exhausts teamed up with stainless steel tubular headers improved air flow, dumping into a common collector. Lastly, is this beautifully presented in rear ¾ projection, a 1987 LX Hatchback in gorgeous blue duco. The detail is well presented, showcasing the factory 7 blade cast alloy rim pattern, the large rear hatch spoiler, aggressive body skirts and the hint of the two rear exhaust pipes just protruding out at the rear. 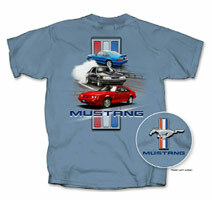 The background of the Tee illustrates the large bold brilliant colours referenced to that of the American flag as depicted on the Mustang Badge emblem, with the background artwork depicting the Armco as recognised at most race tracks. The large script below the main artwork is of ‘MUSTANG” in dark blue font with white ghost like shadowing. 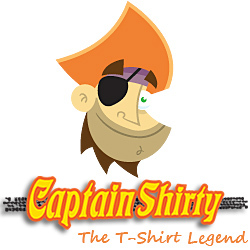 T’shirt shirt Colour: Available in Stone Blue only with Genuine FORD Official merchandise Tag decal.